On June 2010, the Lebanese Council for Development and Reconstruction (CDR) Beirut, contracted the detailed design aspects of the Manzoul Dam in the Lebanese Caza of Metn to Associated Consulting Engineers (ACE). • Ancillary works included a spillway, a water treatment plant, transmission lines and a pumping station. • Design of access roads to the Dam surrounding area and to the different water facilities. 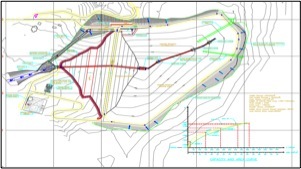 Preliminary and detailed design with the preparation of the corresponding reports and documents for a rockfill dam of 500,000 m3 in the Metn Caza of Lebanon.